Home/Skepticism/Comment o’ the Week: Very Special Monday Edition! Comment o’ the Week: Very Special Monday Edition! Hello again, darling Skepchick readers! The long holiday weekend allowed me to take off for the rolling farmlands of my South Jersey home, but sadly interfered with my usual Friday posting of the Comment o’ the Week. With that in mind, I give you a Very Special Monday Edition of CotW. I’m thinking that Tycho Brahe would show up at the designated time in a rain-soaked field just outside of Philadelphia, angrily awaiting the appearance of Franklin. His elk and his dwarf would be sitting nearby, patiently anticipating their moment of glory. A few hours later, Brahe would pack up his Supernova doomsday device and go home. In the following weeks, the world’s scientific journals would be abuzz with accounts of Benjamin Franklin’s shameful cowardice in the face of Denmark’s most brilliant scientist. Franklin would dismiss these accusations with jocular, pithy remarks in the Philadelphia Gazette, insisting that he was off pursuing worthier activities at the time and honestly couldn’t be bothered with anything so dreary as a duel of honor. Thanks to Rav Winston for the photos! More pics of the Philly Craziness can be seen on the Flickr Skeptics Group and on Jason’s Facebook page. Also, here’s our regular tip to new commenters like Draconius: go to Gravar.com to upload a pretty picture to appear next to your posts! Just sign up there using the same e-mail address you used here, and it’ll appear eventually. Hey I’m on Skepchick! Haha that was such a blast. I have some more pics going up on my facebook account including a couple that I snuck with my camera phone in the museum (damned no photography rule). And thus the Philly Skeptic Association is born. 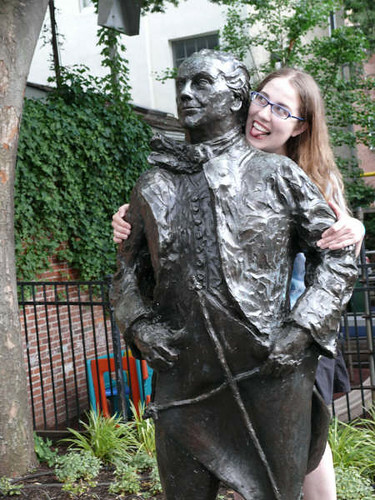 Conception, of course, occurred via molestation of Ben Franklin. And to think that I almost forgot that statue was there. Okay, that was creepy. I was just trying to figure out how to upload my picture for a user icon and you actually answered my question in your post! We ran into a lot of coincidences that day, really– My favourite was that Franklin was born in Boston and came down to Philadelphia, whereas Rebecca was born in ( okay, “near”) Philadelphia, and fled to Boston! What are the odds! Our Skepchick is like, Ben Franklin! In reverse! Draconius–if all goes well, we’ll have another event in the Philly area soon enough. You’re welcome to join us! Alas, Kirsten Jørgensdatter will be heartbroken…. As a NJ skeptic who divides my loyalties between NYC and Philadelphia, I am hoping to find more people for a central NJ skeptical meet-up and/or drink-up…. Of course, New Yorkers and Philadelphians would be welcome too (even Bostonians would not be turned away)! Let’s all go to Cape May, rent a B&B, and be skeptical at random holiday-makers! HAHA! That sounds like a fantastic idea Rav Winston! We’ll go be skeptical about the fake sunken boat and the poorly kept zoo. Okay, now *I* was thinking of starting up a Central Jersey Skeptics Group, just so that it’d be more accessible to both North Jerseyans and South Jerseyans, but Cape May is absolutely one of my favoritiest places in the world, so I’d absolutely be up for that day trip! I’m leaning toward New Brunswick, NJ for the meet-up. What say you, fellow New Jerseyans, Pennsylvanians or New Yorkers (or anyone else willing to travel to NJ)? Oh, fine. FINE. Why is it that all the cool stuff comes to Jersey — CENTRAL Jersey, yet — after I move out? …admittedly, five years after I moved out. Hey, Baltimore! Anyone for Baltimore? I hadn’t realized so many of us were Jerseyians! I am filled with state pride! Make sure you check out my comment about Rebecca and the statue under the Sperms of Endearment thread. It is actually true! Since I live around Morristown I am in if there is going to be a Jersey Skeptics Association or just a meet-up. It occurs to me that you all might want to organize an email list of NJ Skeptics without having to post your email addresses on a public blog. How about, anyone who wants on the new NJSA email list, send me a note at skepchick at skepchick dot org EDIT: Duh, sorry, just post that you’re interested here in this thread actually…I can see your email addresses. In a day or two I’ll send out an email to all of you with your addresses exposed, and you can take it from there. Hey Rebecca, can I beg for an official post about this? I think a lot of people will miss this as a comment on your post of the week. I live near Philly, of course– But I went to Rutgers University in the dim and distant past. I might be persuaded to take a daytrip up to my old Alma Mater. WOOHOO! Three votes for Cape May! –And the BESTEST seaside pancake house on the east coast! –And the Mad Batter does really good and authentic clam chowder. Thanks Rebecca for helping to coordinate this! Protesilaus, Draconius, or LOLkate, any chance you will add to our numbers for the inaugural Central NJ Drinking Skeptically? All are welcome! My apologies for the short notice, though it should be the first outing of many! New Brunswick will be a bit of a drive for me (I work in Northvale/Rockleigh, NJ). Probably won’t be able to make a weekday trip without more notice. I might be able to make it for a short while…Will have to see how it goes. Thanks for replying, Protesilaus… it’d be great if you can make it even if only for a short while, sorry again for the short notice. No problem, trust me if this works out it will be a great story about how we formed our group in the comments section of the skepchicks’ website. I wish I could, but sadly my duties call me elsewhere. poo. Waltdakind is there a location and time yet? Rebecca I am also interested to be on the e-mail list.